This page contains instructions for staff members processing materials that have been transferred to the archives. Additional instructions for dealing with new accessions can be found on the University Archives Staff Resources page. All files transferred from Box.com should be renamed as follows. Before you rename the files, create a spreadsheet to track the original and newly assigned file names and save it in the same folder as the files. 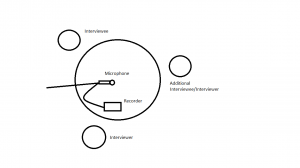 Instance number: This number allows multiple interviews/accessions on the same date. While it will almost always be 01, this has been built in to allow for special events where multiple people are interviewed on the same day or dates on which multiple people make submissions. File number: This number allows for multiple files to be collected per instance. 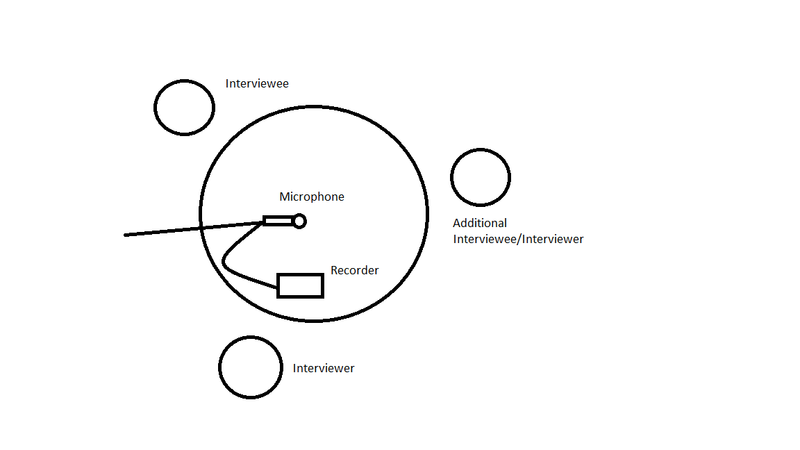 For example, this could include a recording of an oral history, a transcript, and photographs of the interviewee. It will be much more common for this number to have variety than the instance number. If the same file types are being collected for a folder of materials (.mp3 file, .doc transcript, .jpg photo), you can be consistent with calling the sound clip 01, the document 02 and the photo 03 (or whatever makes sense) for ease of referral, but it’s not necessary to do that across the board. Log in to the Box.com account. Create a folder in the digital repository. In the Box.com folder, click the box to select all of the files (to the right of the “Prev Next” page options). A menu will pop up. Select “Download” and direct the files to the folder you’ve established in the digital repository. Rename the files so they conform to the EVA format. Attach metadata to the files. Reformat any files that aren’t in optimal formats. You may also want to reformat to lower quality files to post online. If you do this, don’t discard the higher quality file. If appropriate, create clips of sound/video files to post online. Upload the files to the Content section of the EVA webpages. Due to pending implementation of the new web server, I’m not sure what the best way to go about doing this is. You’ll have to experiment. Make sure all air conditioners and other noisy appliances are turned off. 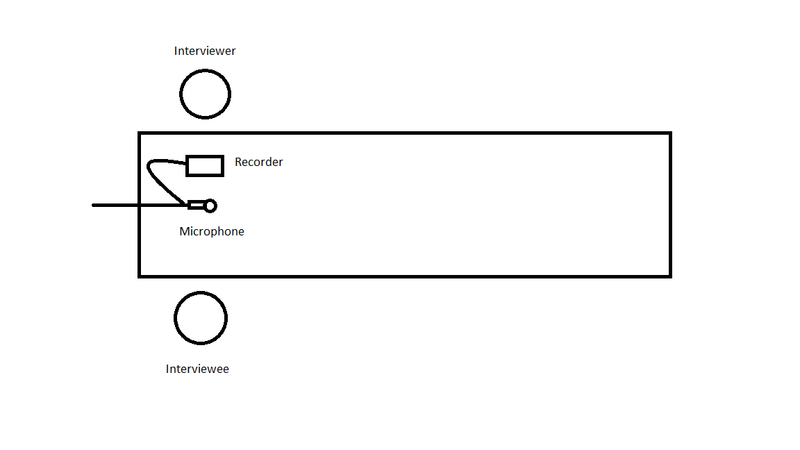 Set up the equipment and space so that the interviewer and interviewee are comfortable and can easily make eye contact. The recorder has an adapter for use with an electrical outlet and also takes AA batteries. There are rechargeable batteries for use with it. It is a good idea to have batteries in the recorder even when using the adapter in case it is accidentally bumped or unplugged to prevent interruptions and data loss. 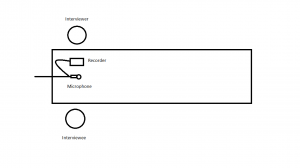 There are two microphone cords. One has a red wrapper on part of the cord. The cord with the red wrapper creates quite a bit of background noise when used in combination with this digital recorder and microphone. I don’t know why, but unless you can figure it out, I would recommend using the other cord. Plug the cord into the left side marked “Mono” if you’re only using one mic. Plug the other end of the cord into the microphone. Use the mic stand to eliminate noise from shuffling it back and forth. The sound quality is good even if it’s not right next to the speaker’s mouth. You will need to plug something into the headphone jack to prevent feedback on the recording. You will only need to wear the headphones during testing and to hear the test recording played back and then you can remove them so you appear more involved in the conversation. Before you start the interview, it’s a good idea to test the equipment to make sure everything is working properly. Hit the “REC” button on the recorder and have everyone go around the table and say something (what they ate for breakfast, their name, etc.) to make sure the mic is picking them up. Play it back over the headphones to test for sound quality and volume. Make any necessary adjustments. Instructions for the finer points of using the digital recorder are available in the owner’s manual kept in the bag with all the other equipment. While testing (and while actually recording) keep an eye on the decibel (dB) indicator at the bottom of the recorder to make sure no one is topping out. The lights should not extend all the way to the right but they should be at least halfway across to make sure it’s not too quiet. There is another indicator light on the bottom of the recorder that will let you know if it’s recording or not. Another way to confirm that recording is taking place is to check the counter on the display screen on the top of the recorder. Connect the short cord to both the green outlet in the side of the transcription machine and the microphone outlet on the computer. Plug the transcription machine into a power outlet. Turn the transcription machine on. Make sure the volume on the transcription machine is low to avoid too much background tape noise. To control the volume on the computer, open the Master Volume controls. You can access this by double clicking the volume icon in the lower right corner of the screen or by going to Start/Accessories/Entertainment/Volume Control. Once you’ve opened the volume controls, click Options in the top menu bar then select Properties. At the top of the properties window there will be a drop down menu called “Mixer device.” Select the input option. This will allow you to control the volume of the audio being recorded by Audacity. Open Audacity. If it’s not installed on the computer, you’ll have to have Library IT or someone with administrative permissions install it for you. Click the Record button (red circle) in the top menu of the Audacity window. Press Play on the transcription machine. When the tape side has run out, the transcription machine will stop on its own but you need to be there to stop Audacity. To do this, click the Stop button (yellow square). Save the file to the desired location, following appropriate file naming conventions (this should be apparent if you’re adding new files to an existing folder. If you’re adding files to a new folder, ask your supervisor or do what makes logical sense to you. Just be consistent). Turn the tape over and start again with a new Audacity project window. Files made from tapes may have stretches of empty space at the beginning and ending of the tracks, depending on where the content on the tape begins and ends. It will look like a straight line before and after the sound waves that indicate content, so you can edit without even having to listen. For more precision, you might want to zoom in on the display. There are three ways to do this. Go to View > Zoom In. Use the keyboard shortcut Ctrl+1. Click on the Zoom icon in the top menu. Once you’ve isolated the section you’d like to delete, use the mouse to highlight that section, just like you’d do with text in a document. You can leave a little bit of empty space so the file doesn’t immediately jump into sound, but this is useful if there’s more than a few seconds. If you have a limited amount of space to upload files or want to highlight a specific section of a file, you might want to make a clip. The first step is to find the part of the file you’d like to clip. To do this, you don’t have to listen to the whole file. You can click anywhere in the file and hit the Play button to start playback at that point. This allows you to find things more quickly. Once you’ve found it, mark down the beginning and end times of the clip. Make sure you’ve hit Stop and not Pause (if you’ve paused and not stopped the playback, it won’t let you copy) and highlight the section you’d like to clip. Copy this selection in one of three ways. Click the Copy icon in the top menu. Open a new blank Audacity File. Paste the clip into this file in one of three ways. Click the Paste icon in the top menu. Double check the beginning and ending of the clip to make sure it starts and stops in the correct places. If it does, save it and you’re done. If it doesn’t, start over at the beginning of this section. Once you’ve finished editing the files or clips, you need to export them as a file that is compatible with media players (the default Audacity project file is only compatible with Audacity). Choose WAV if you want preservation quality audio. It’s important to save a WAV copy of full files to the digital repository but it’s not necessary for clips taken from these full files. Choose MP3 if you want to stream it online. Clips will generally be MP3s. You may choose to save a file as both, with a WAV copy in the repository and an MP3 file for the website. A box will pop up that allows you to choose the save location. This will usually be the RS folder on the digital repository. If you haven’t set one up yet, do that now and come back to this. File name: If you’ve already given the file an EVA form compliant name, you can leave it as is. If not, do that now. Save as type: In this drop down menu, select WAV. Click save. Another box will pop up so you can add/edit Audacity Metadata. Click Okay. Depending on the size of the file, this may take a few minutes. Because MP3 is a proprietary format, you have to download a separate file, the LAME MP3 Encoder, in order to convert files. This file may already be on your computer. If it’s not, contact the IT HelpDesk to have it installed. You will find out when you try to export to MP3 whether you have it or not. Save as type: In this drop down menu, select MP3. Click save. If you don’t have the LAME MP3 Encoder installed, you’ll find out now. If you do have it installed, another box will pop up so you can add/edit Audacity Metadata.